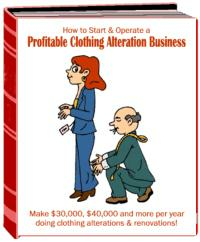 Make $30,000, $40,000 and more per year doing clothing alterations! 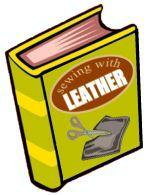 Do you love sewing? Do you need a little extra money? Or a LOT of extra money? Would you like to stay home with the children instead of working a 9 to 5 job? Would you like to be in control of your own time? Does financial independence sound exciting to you? How about a new car? Would you like to take a "real" vacation this year? Clothing alterations could be your answer! Who would be your customers? Teachers, secretaries, doctors, dentists, friends, neighbors, sales people - nearly EVERYONE in your town would be a potential customer. We'll show you how to contact them and how to get them to refer you to all of their friends and co-workers. Turning your sewing hobby into a money making business can be done with VERY LITTLE money up front. In fact, we'll show you how to get started with NO up-front money! We've even included a whole NEW section on special services YOU can provide, that no one else in town has even thought of! You'll be the ONLY one offering these services, and your excited and happy customers will be back on a regular basis, and they'll be telling their friends about your work! "How To Start and Operate A Profitable Clothing Alteration Business" is a COMPLETE MANUAL for your part time or full time alterations business. Virtually ANYONE can be a success in this business if they make up their mind to do it and start TODAY! SPECIAL services you can offer that nobody else offers! Where you can get thread and notions at WHOLESALE PRICES! If you follow the easy-to-understand step-by-step instructions and advice given throughout this golden opportunity manual, you can have your clothing alteration business "up and running" within a few days! All you need are a sewing machine and your sewing ability and PRESTO! you're ready for business. You do not need a lot of money to become a success in this business - just sewing ability and a willingness to follow the instructions in this complete manual. 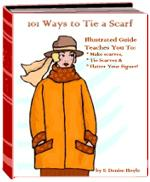 Order your copy today.